What sets Jade Bloom’s ultra luxury conditioner formulation above other natural or synthetic based conditioner formulations? I love the quality of this conditioner. It does what I need it to do without my hair feeling coated plus the benefits of the oils in it. But I have long hair and find the cost difficult on the budget. I love this conditioner. I have RA and other health issues, so between the RA and other meds I am taking, my scalp itches constantly. This conditioner has made a huge difference! 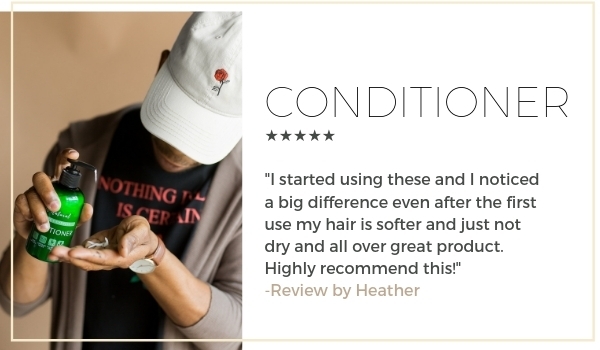 I was skeptical about using this because I generally do not use conditioner for my hair... but I love the sensation this gives!! IT SMELLS DEVINE...MY HAIR IS VERY LONG I CAN ALMOST USE A WHOLE BOTTLE. oh my gosh. First of all I bought the Peppermint & Rosemary shampoo...oh my goobers, does my hair shine so bright that I need sunglasses to see it!! Then I bought this conditioner. It's like I am walking around with a cloud on my head filled with heavenly scents. There's a wonderful and refreshing scent of peppermint and tea tree CONSTANTLY surrounding me! Oh I am in heaven!! If I can smell it then I know others can too and eventually someone is going to ask me about what is that delicious aroma!! hair feels so good and soft and looks genuinely healthy!! The only drawback is that I cut my hair so short that I cant pull it up to my nose and inhale all this goodness. I dont regret my purchase and I am definitely alot happier than buying that expensive and super toxic stuff at the grocery store or at the big box chain. Give it a try...you have nothing to lose and everything to gain!! You will be very happy and become a Jade Bloomer for life! I was really looking forward to trying this product but I couldn't get past the smell. I have not used this long but so far it seems to be a good conditioner. It does cause that overly conditioned feel which is great. The scent is strong in the shower but does not seem to linger in the hair to the point that it is bothersome. I just love this conditioner. I have course gray hair and it makes my hair so soft and manageable!! This conditioner works very well and I love the aroma. works great and smells great. I love the scent of Tea Tree which is so prominent in this conditioner. The consistency is actually pretty thick and really does the job well. I enjoy this conditioner. It helps me feel squeaky clean and yet leaves my hair soft. If I put it up right after the shower I am greeted by the tea tree oil smell again when I let my hair down, nice! Not only is it making my hair shine and manageable, it is helping keep mosquitoes off my neck. Takes a few times for hair to adjust to extra oil. Once a week I use a different shampoo to clear oil.